Rediff.com » Movies » How Bollywood beats the summer heat! How Bollywood beats the summer heat! How to keep it cool in the blazing hot summers? Bring out the lemonades and linens! Summer is upon us and the only way to beat the heat is to treat everything with a sense of humour. And what better way to start than with Bollywood? We’ve compiled some fun wisdom on how tinsel town’s hottest stars handle the hottest time of the year in the movies. What happens when the most scorching star on earth comes in contact with the most scorching star of the solar system? But if it involves Sunny Leone soaking its own kind in itsy-bitsy swimsuits, let’s see who complains. Any mention of bare bodies invariably leads us to Aamir Khan’s nanga punga display -- one that makes John Abraham’s yellow trunk appearance so terribly overdressed, one that you’re better off not impersonating in public lest you wish to feel the heat of the worst kind. Considering everyone roams around naked on his planet, one can only imagine how sweltering the weather must be. Katrina Kaif sure knows how to keep it cool. And no, we don’t mean by sipping by all those complimentary cartons of mango juice. The stunner is a pro at what looks like Bollywood’s idea of water yoga aka Broke-my-back-trying-to-bend-it-like-Kaif. Flash your a, er, sass! Here’s how Anushka Sharma takes care of her ‘chippp chippp’ woes. A dip in the village pond that includes flaunting her tattooed rear, sassily signed -- Dekho magar pyaar se. Extreme temperatures can cause people to become all cuckoo. In Bollywood, it translates to entertainment. Akshay Kumar and Salman Khan’s desperate dance to whip up some breeze wearing hilarious hula skirts is a case in point. Everybody loves to gobble on heem-creem in summers. Can you match Sonam Kapoor’s enthusiasm? The Aisha star likes it so much; she’s parked herself in an empty refrigerator with a tub full of chocolate flavoured ice cream. P:S: Doesn’t this image bring back creepy memories of a frosted Pallavi Joshi in one episode of Zee Horror Show? All those profound speeches on fighting depression and woman empowerment must get tiring for the Piku gal. Deepika Padukone catches up on her beauty sleep in an outfit that aims to provide comfort to both -- the wearer as well as beholder. Where mortals shed clothes and accept ice bucket challenges to escape the sun, Hrithik ‘I am so cool’ Roshan magically transforms into an aquatic being. Look how the man leaps out of the sea like a dolphin. Only with squirt guns in both hands! Drink lots of fluids is the ultimate cliché of summer dietary tips. Kareena Kapoor would know. She’s co-authored a book on all things fashion and beauty. Those colourful coolers on her side while she lounges in the sun sure underscore Bebo practises what she preaches. Flanked by leggy lasses (Nargis Fakhri and Ileana D’Cruz) on either side, Varun Dhawan and his proud torso suggest, it’s a great season for body beautiful folk. Don’t you think the troika looks straight out of an Archie Comics ‘Summer Fun’ cover in that pose? Everybody likes a fanboy. Especially the ones that follow you everywhere with a portable fan in hand like Imran Khan. Bet Sonam didn’t sweat over all that attention. Who would if such eye-catching provision for mobile breeze was at one’s disposal? 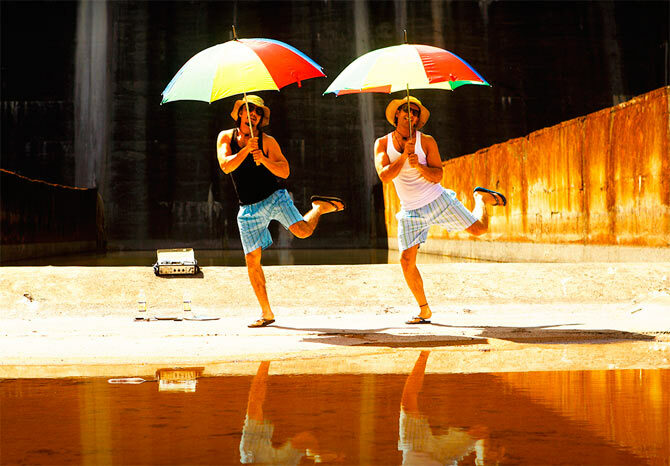 Underwear-clad Ranveer Singh and Ali Zafar take refuge under colourful umbrellas whilst doing an impromptu jig. Such a Dhoop mein nikla na karo moment, this! You’d think everyone (unless you’re the Dhoop-pleading Jadoo of Koi... Mil Gaya) prefers to finish their job huddled in air conditioned offices. Not Bollywood and its extreme pursuit of Vitamin D.
And so you have John Abraham’s photographer grabbing snapshots of a smouldering Shilpa Shetty against Miami’s gorgeous beach backdrop, hard work was never rewarded this favourably.